On May 23, 2013...We LOVE this dog!!! I can't say enough. She has settled in so well. We've been going on daily walks, and she is responding well. We did put up a baby gate at the top of the stairs for the cats, and that solved that problem. Cats get the upstairs, Coco gets the rest of the house. And the kid, so Coco wins! We are all so grateful that Coco found us. She is another example of how the world always works in mysterious and perfect ways. Thank you again for everything. Vicki, Geoff, Alina, and Coco. This pretty young female was a casualty of a divorce. When her owners divorced, the wife kept COCO. He thought she will be taking good care of her. A friend of him, called him to tell him that his ex, had kept COCO in the yard and she was packed with fleas. 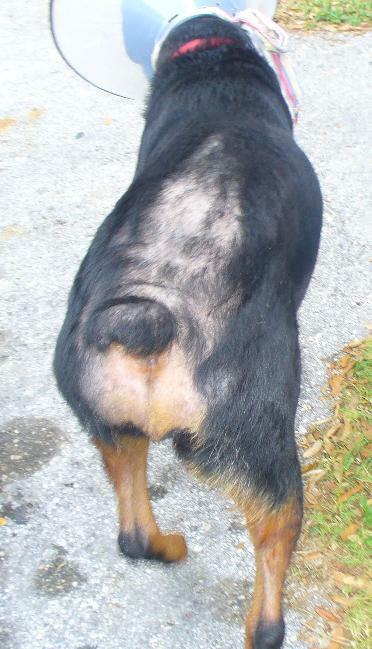 In a very short time, apparently COCO had a bad allergy to fleas and lost most of her back hair. 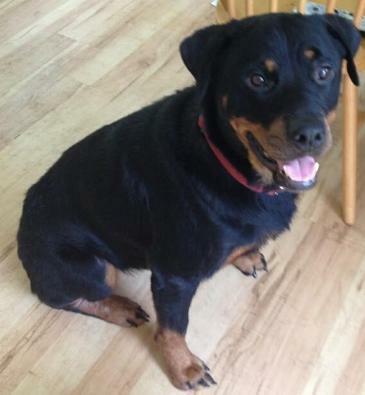 He went and got her, then contacted the Guardian Angels as the place he lives now, would not accept a Rottweiler. A wonderful couple that came from Sarasota to Mueller Animal Hospital and adopted Tank, did GGARR a favor to bring COCO to Mueller. She was spayed, now fully vaccinated, tested for Heart Worms and negative and also Microchip. Dr. Adriana put her on Antibiotics and Prednisone and order a good special Dip. Hopefully that will stop her scratching and ready for her new Forever Home sometime next week. 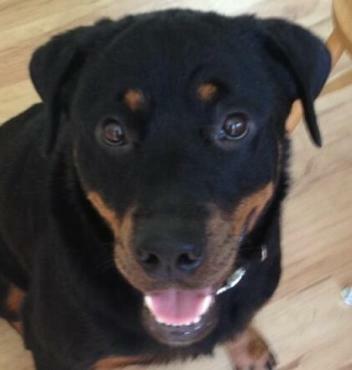 COCO is on the sweetest Rotties we have ever have had and deserves the best.